This quirky Chicken will stop your doors banging in style! It’s both decorative and practical and will liven up any room. 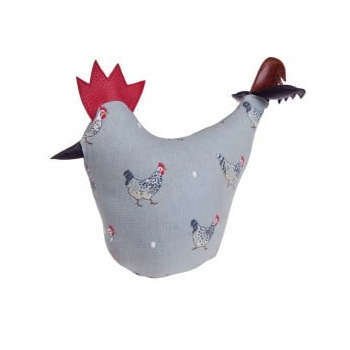 Made from Sophie Allport’s chicken fabric it features Speckled Maran hens and some white eggs on a sage grey background. The tail and cockscomb are made from leather. The door stop is approximately 38.5cm (from beak to tail) x 30cm (height) and weighs 1.5kg so is strong enough to hold your heaviest doors open.